I wrote a while back about riding my bike in the colder winter temps without my dog and feeding the squirrels in her absence. The little guys don’t have as much to eat with the cold temps and thinned ranks of tourists on the lakefront. I learned something new the other day. 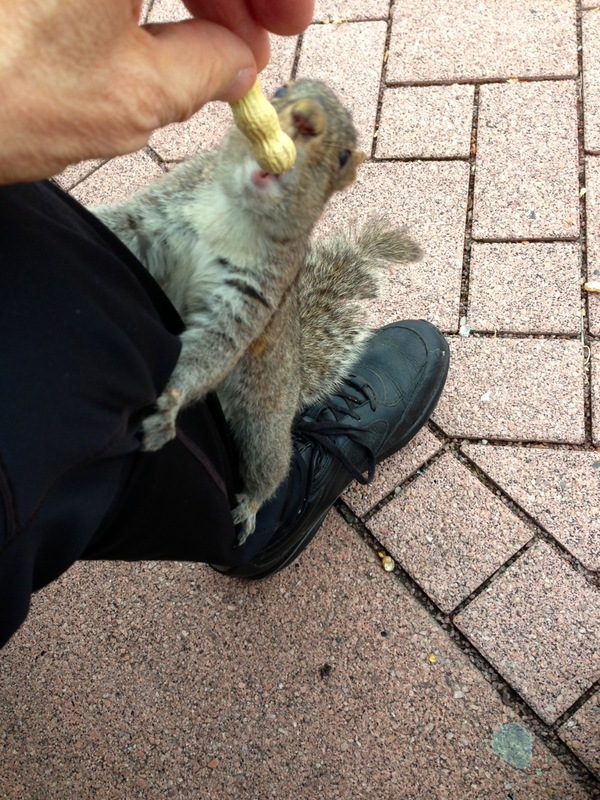 I stopped for a rest around Buckingham Fountain and was tossing nuts to a squirrel when I wondered if he would take one out of my fingers. I know they are wild animals (tiny, but still wild), but I thought if I held a long peanut, there wasn’t much chance of getting bit. I tried that andhe took it out of my fingers and scampered away to eat it. What I didn’t realize is that this apparently removed a barrier between us. He no longer considered my a possible predator, just a source of food. We had become buddies. The next time I was holding a peanut he ran up my leg to get it. As you can see below, I had my iPhone videocamera ready. As you can see from the video, I was able to catch him in the act. You can see my previous squirrely encounter here. This entry was posted in bikes, Buckingham Fountain, Chicago Lakefront, nature, outdoors, photos, squirrel and tagged animals, bikes, Buckingham Fountain, Chicago Lakefront, cold temps, nature, outdoors, photography, photos, riding my bike, squirrel eating, squirrely, wild animals, winter temps by willingwheeling. Bookmark the permalink. I was surprised when he came up my leg a second time when I had the cameraphone ready. But, like I said, I think the barrier between us had disappeared in his mind. I was no longer a potential predator, I had just become a source of food. As long as I’m not the guy who got bit by the squirrel.